I am trying to use AppCode with an External Build System project (Makefile) but I am not able to get a DEBUG version of the software built using AppCode. I'd expect that the configuration selection would get passed into the xcodebuild statement, but regardless of whether I am building in release or debug mode, there is no configuration passed into xcodebuild. If I execute the above command from a Terminal console and add the "-configuration Debug" option, I get the behavior I'd expect. Is there something that I am missing in the project settings or configuration settings that would allow me to get this functionality? I'm using the 2.5.1 build and the latest XCode from the App Store on Mavericks. Hello. Thank you for the reply. I am unable to locate a "Schemes" page. I don't know if that is something that is not available to a Makefile project or if I'm just missing something. Could you provide instructions to get to the screen that you showed me? 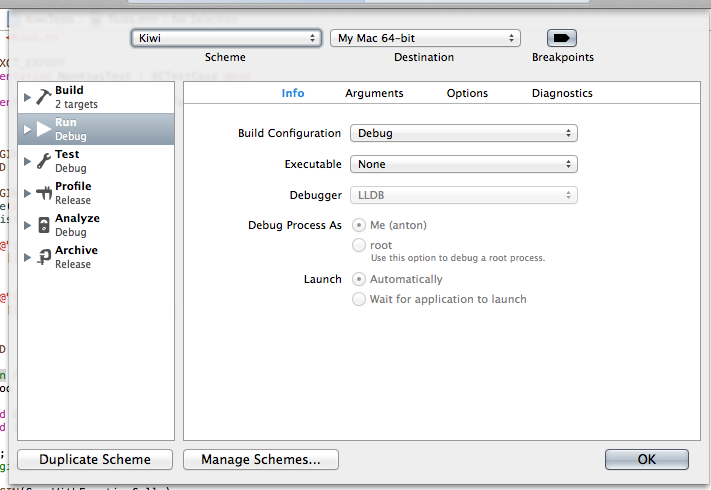 Schemes can be configured either in Xcode. 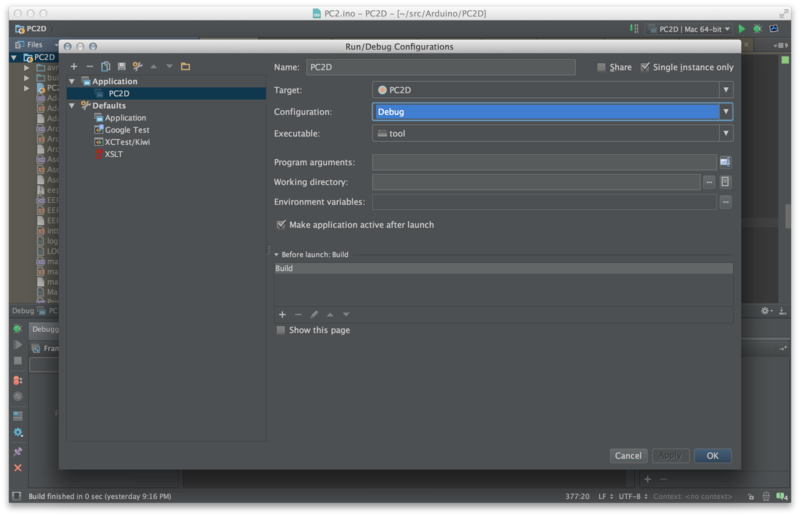 I am using AppCode and I'd already configured my configuration to be Debug. The problem is that it doesn't seem to matter if I've got it selected as Debug or Not. The command to the compiler does not pass the Configuration on to the compiler, so it always builds in release mode. I've attached my screen shot of the Edit Configurations for the project. please make sure that building from Xcode launches the compiler with correct flags; and if there is difference with how AppCode compiles it, file a bug report in the tracker and attach build log from Xcode and AppCode for the same scheme/run configuration. Also, if a sample project will be helpful. If both Xcode and AppCode compile the target similarly, it's the project-specific configuration problem that should be fixed by correctly configuring it.